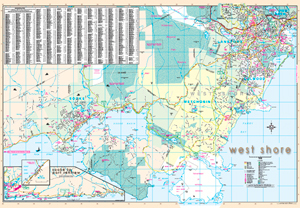 West Shore Wall Map (Victoria) 36"x 52"
The West ShoreWall Map displays in detail all streets and related features for the "West Shore" municipalities which encompass Colwood, Langford, Metchosin, Sooke and View Royal. 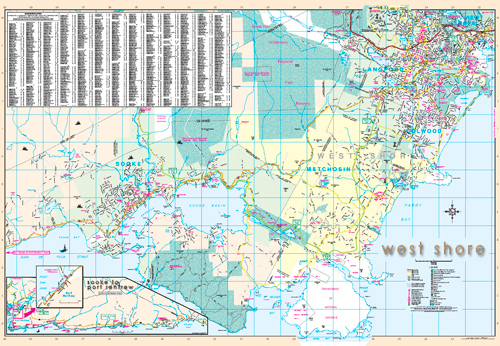 The map also includes a detailed inset from Sooke to Port Renfrew. Related features include Block Numbers, Parks, Golf Courses and Cemeteries, as well as locations for Schools - Elementary, Secondary and Private, Hospitals, Police Stations, Fire Halls, Libraries, Shopping Centres, Community / Recreation Centres, Points of Interest and Visitor Centres.